It was a very early start made slightly more difficult by the fact that we couldn’t access the 7th floor, where our hotel serves breakfast, until 6.30 as they don’t allow the lift to go there despite Marus and I trying endlessly. Heading out of Bordeaux the traffic was pretty rubbish again but the sun was coming up nicely. 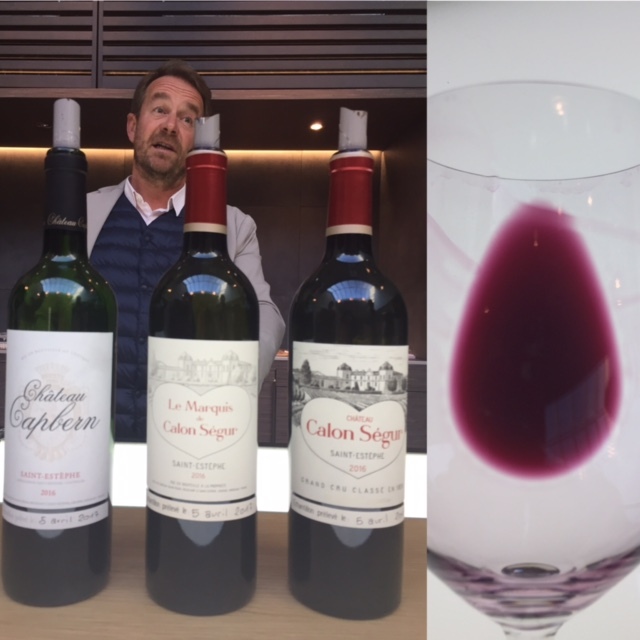 We were headed to pretty much the northern tip of serious Bordeaux wines and that meant St.Estephe, Calon-Segur being the exactly starting point – The quality here has always been good but these last few years it is stellar and Calon itself is one of the very first names that rolls off the tongue when I get asked for highlights in this vintage. 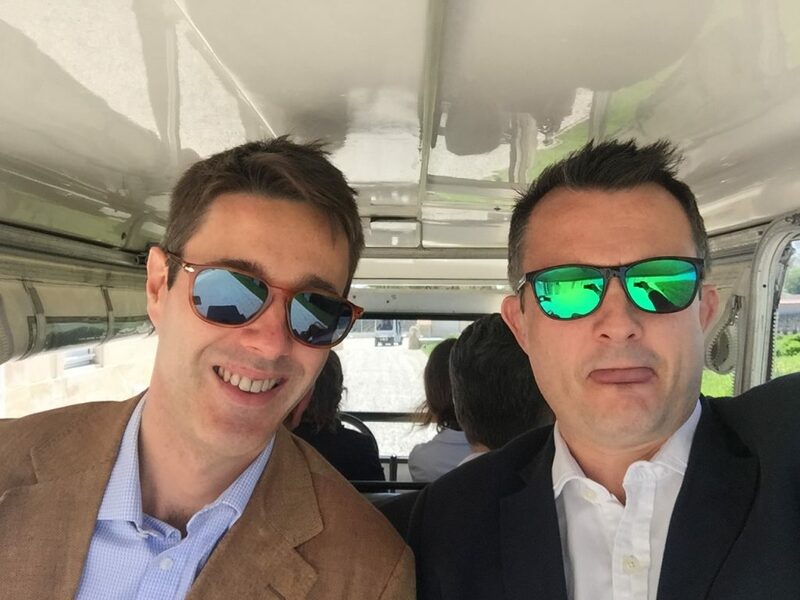 We then dipped down into Pauillac for Leoville Poyferre & Grand-Puy-Lacoste, I love Poyferre but was a tiny bit underwhelmed here, other members of the team weren’t so I put that down to “driver” error. GPL, it’s street name, was yet again a tremendous, tender but proper wine, another good estate arguably punching above its weight these last few years. Back up the coast road, with a “romantic” view to the right over the Gironde to the Nuclear power plant (different energy!) and to the tropical palm trees of Montrose with the tricolor proudly taking pride of place. The chai, and general facilities here, is/are quite something. 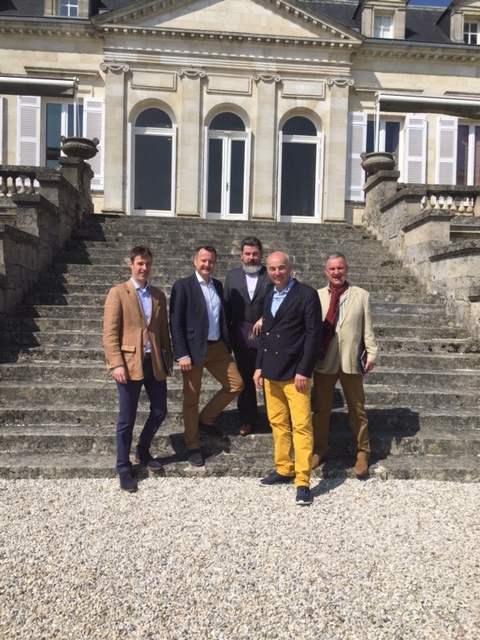 Pauillac again for Pontet Canet before lunch! 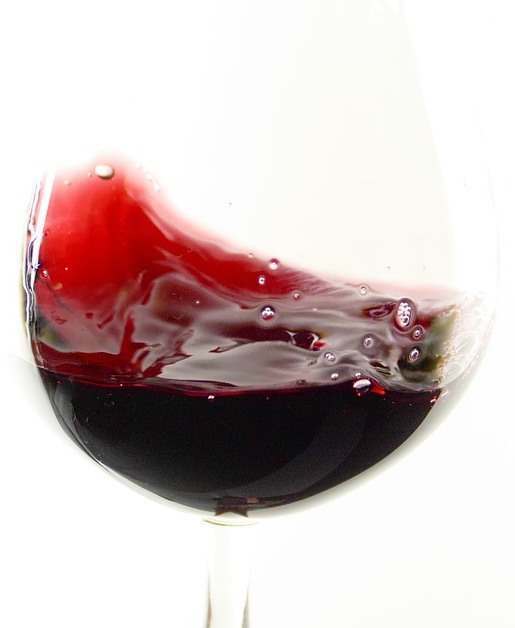 The wine is very good again, rich and full, no second wine was made so it is 100% Grand Vin, this being the reward for the Biodynamics that started 10 years ago. One of the very few places where decanters are used. As you walk through the old vat room (no longer used) anyone who has played cricket is immediately brought to attention by the pungent linseed oil aromas. 1) A light but stylish, almost always unbranded, down-filled gilet worn under a more formal jacket. 3) Glasses (specs) – these are obviously not for everyone but are a great, firm but gentle, arm waving and emphasizing tool, used to great effect by many. It was now time for a very brief lunch, we all went for fish – Café Lavinal in the Bages village is a good spot – give it a go. Lunch had to be quick as we had a round of golf booked! Well hardly, but those who have been to Mouton will know what I mean. You are taken to the tasting room, at the back of the chai, by golf cart. The wines though were splendid and the tasting room very busy. The first growth afternoon carried on with a trip up to Lafite, we took the back road which emphasizes that whilst the left bank it largely flat that is not always the case. Continuing the golf theme if you were to use the left bank to create (a ludicrously expensive) golf course then the Pauillac/St.Estephe border would be a good undulating spot. I can’t quite see Lafite and Cos d’Estournel selling up for this purpose though. 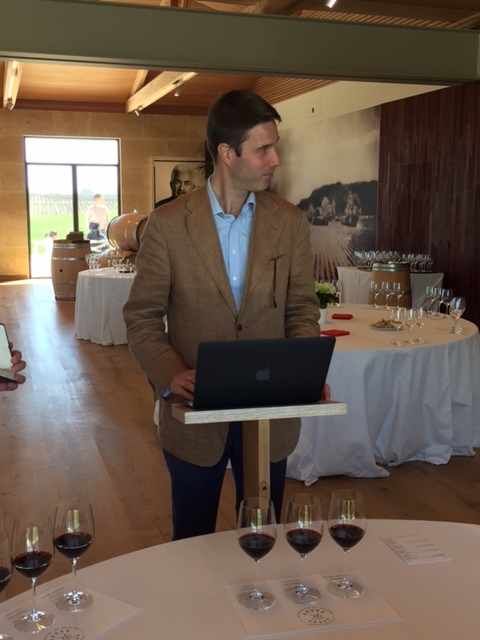 The tasting room at Lafite has introduced an interesting aid for those, like me and Mr Seddon, who use laptops for our notes, they give you a small lectern – very helpful for avoiding back issues! 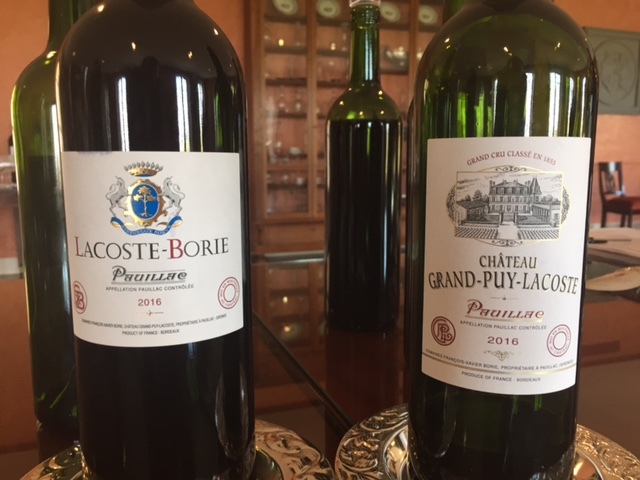 The wines at Lafite were serious, as they should be, with wonderful potential – very proper. 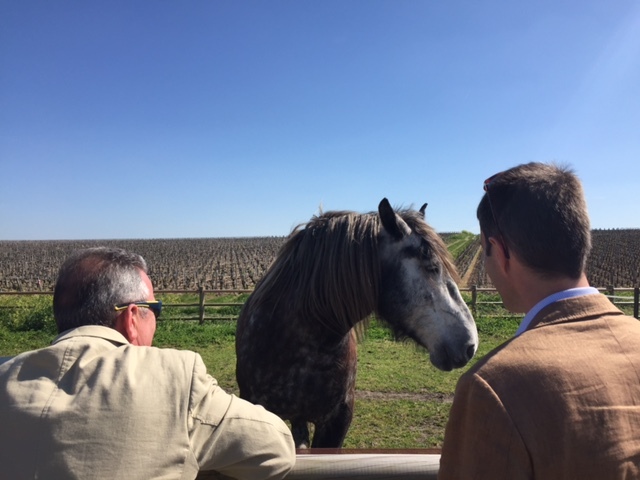 We then managed to be almost an hour early for Latour but this gave us a great opportunity to watch the horses in action and for me to interview Guy about the tastings so far (video coming soon). The tasting itself was everything you would want from Latour. Despite their decision to release their wines when they start to drink the team at Latour do still show the new vintage, we will have to wait for the release of 2016 but it will be worth the wait! We also got to taste the latest release; Pauillac de Latour 2012, Forts 2011 and Latour 2005 which was very welcome, the Latour 2005 in particular is stunning, just starting to show “it’s stuff”. Or last appointment of the day was with the charming Anne-Francoise Quié at Rauzan Gassies where we tasted the 2016 from the property and their other estate, Croizet-Bages in Pauillac. Both estates have done a good job. The chai at Rauzan is undergoing major renovation as this sometimes forgotten estate continues it resurgence. From Margaux it was time to head back to Bordeaux. Marco from HK was now heading off and the Scottish office – Bryce and Chris – were arriving. Dinner at an, undeservedly, empty Le M de Monbadon was a lot of fun with good food and was followed by a (just one!) Calvados. Friday (Day 6) promised much so it would have been a real shame to start with anything but a clear head! Topics of discussion at dinner: Rorke’s drift, Golf and food.